As most of you know my dad is a vet. Growing up his profession gave me the opportunity to adopt A LOT of pets. Throughout the years I have had goats, pigs, dogs, javelinas, a deer, a bunny, horses, cows, and of course cats. This story revolves around one of my cats..."Blacky." Around the age of 5 I was obsessed with the idea of flying. I was convinced that if I wished hard enough that I would be able to do it. So one day, I decided that today was indeed the day that I was going to fly. However, I was smart enough to know that I better test out my "flying experiment" before I tried it myself. I went outside, and the first volunteer I spotted was my cat Blacky. "Here Blacky! Here Kitty Kitty!" I called out to her. Black immediately ran to me and I began scratching her right behind her ears. She loved that. "We are going to fly." I told her. With Blacky in my arms I climbed up the stairs of my tree house. When I got to the top, I held Blacky over the edge and let go. To my dismay (and Blacky's) instead of soaring high in the sky (like I honestly thought she would) gravity pulled her straight down and she screeched "RARRRRARARAR." Luckily, she landed right on her feet. "Oh No!" I yelled as I ran back down the stairs. "Blacky, I am so sorry! Here Kitty Kitty." This time Blacky was not so trusting. She hissed at me and ran away. I felt horrible and started crying. "Daddy..Daddy" I called. "Blacky hates me." My dad reassured me that Blacky did not hate me. He also informed me that cats could not fly and made me promise not to try my experiment with any more of our pets or myself. What I would like people to take away from this is kids do have active imaginations....but cats cannot fly. 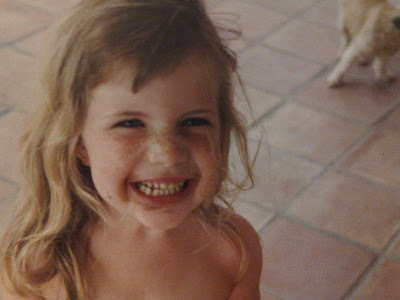 Also, I was a cute kid! The End!